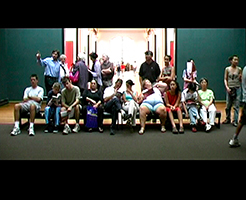 Night Watch is a 6 minute video loop of a group of people who are seated on a bench in front of Rembrandt’s renowned painting, The Night Watch. 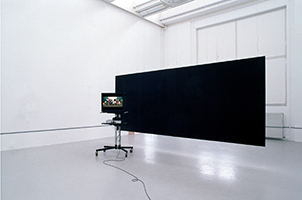 The museum visitors are filmed from the perspective of the painting itself so that we do not actually see it and the title is our only clue to its participation. The group of people on the bench do somewhat reflect the composition of the familiar figures posed in the painting. 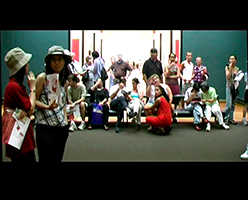 Some visitors read their brochures, others seem fatigued and happy to take a rest, others are turned backwards, while only a few seem to actually look at the painting or at the photographer who positioned herself with her camera in front of the painting. By focusing on the museum visitors instead of on the art work the artist presents us with a study of the collective behaviour of people in a specific institutional context, which shows something quite different than the reflective gaze one might expect to find here in this citadel of fine arts.